In 1621, a ship carrying 101 men, women, and children spent 66 days traveling the Atlantic Ocean, to settle in what would become, later, the United States of America. Much later, in 1863, and 150 years ago, President Abraham Lincoln declared two national Thanksgivings; one in August to commemorate the Battle of Gettysburg and the other in November to give thanks for general blessings. The history of this great land is one of struggle to live a simple life. America is a beautiful place and our ancestors celebrated Thanksgiving to declare blessings of military victory, the end of disease or a drought. In 2013, sadly, we celebrate Thanksgiving by opening box stores early for hungry consumers and greedy retailers who can’t wait an extra 12-24 hours to kickoff the holiday shopping frenzy. Doorbusters. Deals. Discounts. We live in a new reality…one where it’s a sport to camp out in a $300 tent days before to save $50 on a flat screen TV imported from China. What is wrong with this? As Mark Sadlin wrote this week in the Huffington Post, there’s a War on Thanksgiving. I believe it. We celebrate Black Friday to commemorate consumerism, not capitalism or free enterprise. Instead of taking time off to spend it with our families, people work, shop and continue to feed this mass hysteria we have around “stuff”. What happened to the simple things…time with family and friends celebrating our freedom and prosperity? And prosperity is not about things or having more stuff. It’s about what you and I, we, create. It’s about true blessings: faith, family, friends. Matt Walsh, father of twins and talk radio host says it well… If you shop on Thanksgiving, you are a part of the problem. I agree. I am a blessed woman, wife, and mother. And this year, like many years, I’m thankful for so much. I celebrate my family, my friends, my health, my faith, and my career. I try to live every day of my life with purpose, growing myself, creating ‘the good life’, giving and serving others, and thanking God for his many blessings. While I have crazy family drama like every other American, you won’t find me near a retail store today, tomorrow or even this weekend. Today is about giving thanks for all we have: the good, bad and the crazy. 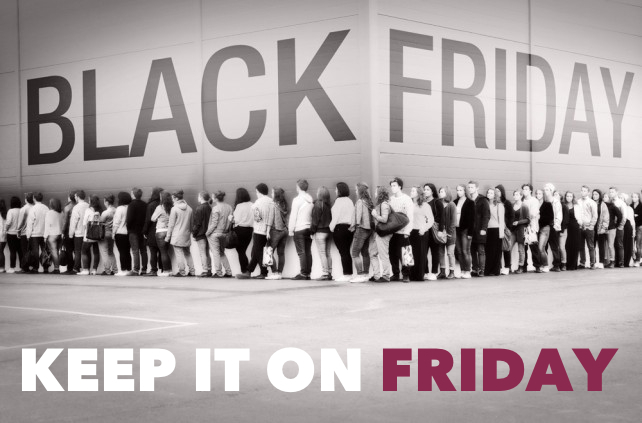 It’s time we reclaim Thanksgiving and let Black Friday be what it was supposed to be: Friday. Embrace your blessings. Make today worth remembering. Happy Thanksgiving!